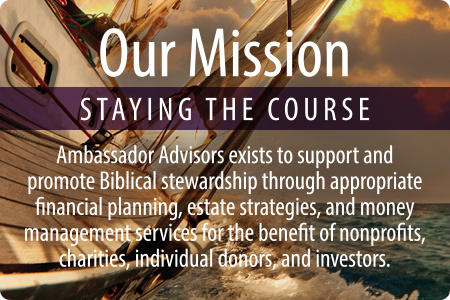 To support and promote Biblical stewardship through appropriate financial planning, estate strategies, and money management services for the benefit of nonprofits, charities, individual donors, and investors. 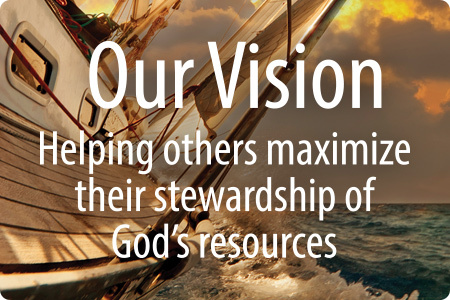 To help others maximize their stewardship of God’s resources. Our highest value is knowing our Creator through His Son, Jesus Christ; we strive to love Him with all our heart and follow His command to love our neighbors as ourselves. We aim to responsibly approach our fiscal and regulatory duties, accept and respect the process and authorities, and conscientiously handle the resources entrusted to us by God and our clients. We strive for excellence in serving our clients and fellow team members. To this end our team participates in industry-specific educational programs and maintains the appropriate credentials so that we are prepared to give the best possible advice. We endeavor to act and communicate with credibility, truth, and trust in all business interactions; we demonstrate a repentant attitude if we fail and a forgiving attitude if others do. We do our best to collaborate with peers, co-workers, and leadership to perform our duties with excellence, subordinating any personal agenda to the mission of Ambassador Advisors; members of our team forthrightly treat others as they themselves would like to be treated. We do our utmost to establish and maintain great relationships by providing expertise and good service to our clients and those they cherish. Not only do you want to find an experienced, knowledgeable financial advisor, it is crucial that you find one who shares your faith. 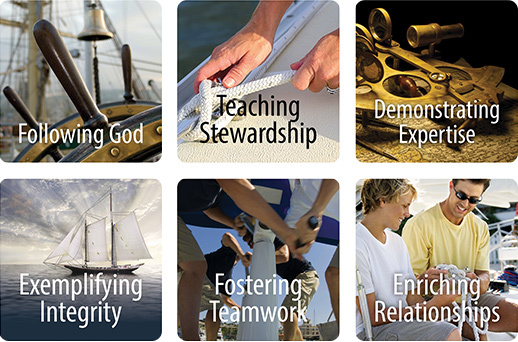 See how our advisors help you become a better steward of your resources and create a lasting legacy.